Ribbon Blender is used to blend powder product like Pharmaceutical, Chemicals, Dyes, Pigments, Organics, Agriculture products, Minerals, Pesticides & Food products. Abster Ribbon Blender is one kind of mixer to mix different powders. 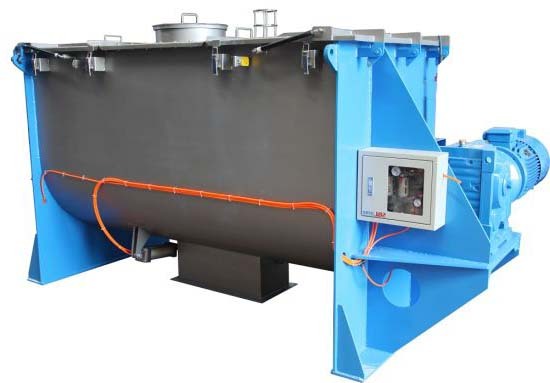 Horizontal mixer is precisely designed to maintain combination of three major dimensions is Diameter, Ribbon width and Pitch. It is for effective distribution of very small amount of additive added is getting effected and assures homogeneity of final output. Powder is got Rotary as well as horizontal motion in positive direction to get effective blending which is happen by design perfect sizing of inner and outer ribbons. Fluid coupling to start blender in loaded condition. Material construction as per requirement. Special changes to fit in Layout.